Topics: Apparel, Caps, And Hats, Automotive Accessories, and Awards And Recognition. 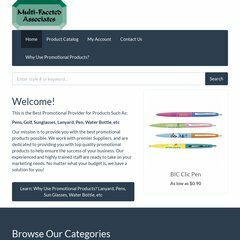 multi-faceted.com Multi Faceted Associates Houston Promotional Products digital .. It has 2 DNS records, ns1.distributorcentral.com, and ns2.distributorcentral.com. Gsi Hosting Missouri is the location of the Microsoft-IIS/7 server. Its IP Number is 206.55.120.6.